International aviation is a massive and complex industry that is crucial to our global economy and way of life. 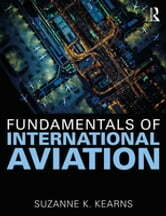 Fundamentals of International Aviation, designed for the next generation of aviation professionals, flips the traditional approach to aviation education. Instead of focusing on one career in one country, it has been designed to introduce the aviation industry on a global scale with a broad view of all the interconnected professional groups. Therefore, this is an appropriate introductory book for any aviation career (including aviation regulators, maintenance engineers, pilots, flight attendants, airline managers, dispatchers, air traffic controllers, and airport managers among many others). Each chapter of this text introduces a different cross-section of the industry, from air law to operations, security to remotely-piloted aircraft (drones). A variety of learning tools are built into each section, including case studies that describe an aviation accident related to the content of each chapter. This book provides a foundation of aviation industry awareness that will support the next generation as they choose a career path that best aligns with their interests and ambitions. It also offers current professionals an enriched understanding of the practices and challenges between the many interconnected professional groups that make up the rich fabric of international aviation. Online slides and a test bank are available as an eResource for this book, which can be found at www.routledge.com/9781138708976.